Originally published in 1985, this title was a retrospective appreciation of the late Richard L. Solomon. His pre- and postdoctoral students from past years presented the 22 papers which are published in this volume. The book reflects the breadth of Solomon’s impact through his teaching and research. The first part contains a chapter that provides a bit of history in a retrospective appreciation of the several foci of Solomon’s research career. This chapter sets the stage for those that follow and reduces their diversity by providing a degree of historical understanding. The second part on the role of properties of fear contains chapters that address various issues associated with the role of conditioned fear. The third part contains papers that address cognitive, information-processing issues in the context of Pavlovian conditioning of appetitive and aversive events, reasoning and timing. The fourth part continues the exploration of the phenomenon of learned helplessness first discovered in Solomon’s laboratory. The fifth part addresses various issues associated with the Solomon and Corbit opponent-process theory of motivation and affect. The final part, on applications to human and cultural issues, contains chapters on such diverse subjects as cross-cultural analyses of aggressive behavior in children, the analysis of resistance to change in industrial organizations, the concept of liberty in formulating research issues in developmental psychology, and the status of free will in modern American psychology. Preface. Part 1: A Retrospective Appreciation of R. L. Solomon 1. Leon J. Kamin Perspectives on the Psychology of Richard L. Solomon Part 2: The Role and Properties of Fear and Aversion 2. F. Robert Brush Genetic Determinants of Avoidance Learning: Mediation by Emotionality? 3. Robert W. Hendersen Fearful Memories: The Motivational Significance of Forgetting 4. Susan Mineka The Frightful Complexity of the Origins of Fears 5. Russell C. Leaf, Stacy Lamon and Betsy Haughton Development of a New Clinical Procedure for Conditioning Aversions to Cigarette Smoking with Perceptually Induced Nausea Part 3: Integration of Information 6. Abraham Black and Andrew Dalrymple Reasoning in the Rat Reconsidered 7. Robert A. Rescorla Pavlovian Conditioning Analogues to Gestalt Perceptual Principles 8. Vincent M. LoLordo, Jeffrey L. Fairless and Kelly J. Stanhope The Effect of Context Uopn Responses to Conditioned Inhibitors 9. Lynn J. Hammond An Empirical Legacy of Two-Process Theory: Two-Term versus Three-Term Relations 10. Russell M. Church Approaches to the Study of Behavior: Examples from Behavioral Pharmacology Part 4: Learned Helplessness 11. Steven F. Maier, Mark L. Laudenslager and Susan M. Ryan Stressor Controllability, Immune Function, and Endogenous Opiates 12. Martin E.P. Seligman and Madelon A. Visintainer Tumor Rejection and Early Experience of Uncontrollable Shock in the Rat 13. J. Bruce Overmier Toward a Reanalysis of the Causal Structure of the Learned Helplessness Syndrome 14. Lauren B. Alloy, Lyn Y. Abramson and Debra A. Kossman The Judgment of Predictability in Depressed and Nondepressed College Students Part 5: Opponent Process Theory 15. Stephen F. Seaman Growth of Morphine Tolerance: The Effect of Dose and Interval Between Doses 16. Robert A. Rosellini An Application of Opponent-Process Theory to Adjunctive Behavior 17. Perrin S. Cohen, Thomas A. Looney, Frank R. Campagnoni and Cindy P. Lawler A Two-State Model of Reinforcer-Induced Motivation 18. Michael B. Cantor and Josephine F. Wilson Feeding the Face: New Directions in Adjunctive Behavior Research Part 6: Extensions to Human and Cultural Issues 19. Edgar H. Schein Organizational Culture: Skill, Defense Mechanism, or Addiction? 20. William W. Lambert What Happens to Children When They Act Aggressively in Six Cultures 21. Richard D. Walk Alexis de Tocqueville, John Stuart Mill, and Developmental Psychology 22. Malcolm R. Westcott Volition is a Nag. Author Index. Subject Index. 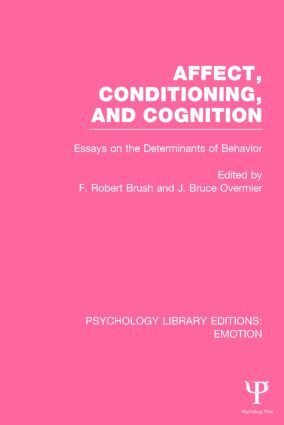 Psychology Library Editions: Emotion makes available again twelve previously out-of-print titles that were originally published between 1976 and 1999. Written by a range of authors from diverse backgrounds and spanning different areas of psychology, such as clinical, cognitive, developmental and social, the volumes feature a variety of approaches and topics. This is a great opportunity to trace the development of research in emotion from a number of different perspectives. These twelve previously out-of-print titles are now available again, either as a set or as individual volumes, in your choice of print or ebook.